KL Tower BASE Jump 2011 took place from from 29th September to 2nd October, coinciding with the 15th Anniversary of KL Tower. This years event was at KL Tower only. 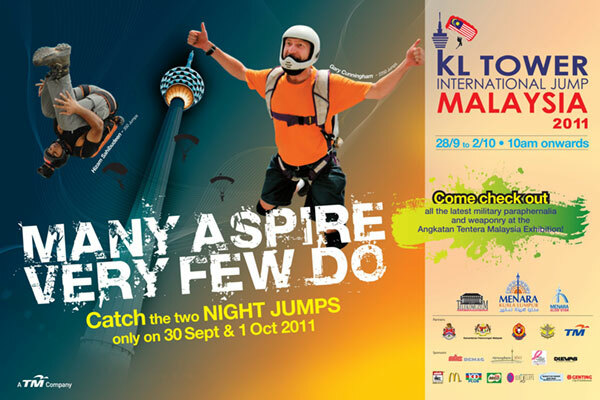 It included 4 days and 2 nights of BASE jumping off KL Tower. 88 BASE jumpers from 22 countries completed over 1800 BASE jumps during the event. This year local Malaysian events management company CD Events were brought back in to organise the event as they did from 2001 to 2004. BASE jumping organisers Aziz Ahmad of Malaysian BASE Association and Gary Cunningham of Australian BASE Association were brought back in to organise the BASE jumping side of the event as they previously did from 2005 to 2007.